PreSonus Eris E5 active studio monitors give you the premium sound option that you need without taking up the space that you don't have. These are real studio monitors that give you a very accurate response with a tight bass and extremely clear upper end. These biamped speakers can be adjusted into the acoustic space, an important feature not usually found in a small, reasonably priced studio monitor. 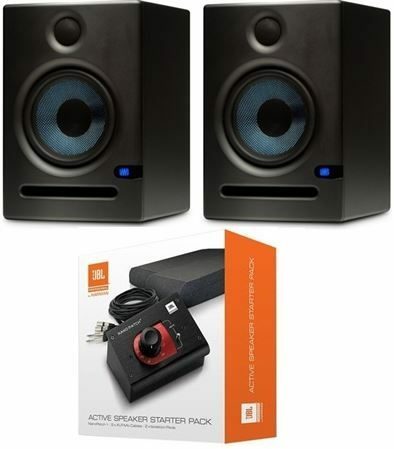 There is no comparison between the E5 2-Way Active Studio Monitor and cheap computer speakers or a home stereo system. The compact size and affordable price tag make this a studio monitor option for any artist. The Eris E5 takes up just 7" x 10.24" x 7.68" and weighs just 10.2 pounds. The small stature means it is pretty portable for packing up and switching rooms or music types. There are several different control adjustments for the active artist. Since there are so many genres of music now, there need to be adjustments for the music and room. The first adjustment is the gain, which affects the signal level before the amp. The next adjustment is the Acoustic tuning section, with high, middle and low cutoff to more finely adjust the sound you want to hear. Another adjustment is the acoustic space switch that is a low shelving filter to compensate for a boundary bass boost. "Best Value in Studio Monitoring"
Overall: I admittedly didn't buy these from zZounds, as for something this personal, I felt I needed to experience them myself before buying. Let me just say, however, that you should absolutely feel comfortable buying these right now. It should go without saying that, with 5.25" drivers, you aren't going to experience chest-pumping bass. If you're in a large room, you may want to consider something a little larger. If, like me, you're in a relatively small room (less than 5 meters per wall, in my case), these will do just fine. Adding a sub will obviously help cover the super low frequencies, but these provide enough extension to allow me to hear what I need from a kick drum or a bass guitar in a rock mix. Your mileage may vary, but for now, I'm going to remain sub-less. The clarity of these speakers is fantastic. As an apartment-dweller, I've been putting off studio monitors for a long time, convincing myself that I would never be able to use them without upsetting neighbors. While I am limited in how hard I can push these in my situation, I can say that mixing on these is a more pleasant (not to mention fruitful) endeavor than even nice headphones. I've built up a list of reference tracks and mixes that I consider very high quality, and while I'd say I'm pretty familiar with them, I'm hearing things with these that I was missing on headphones. I've been a student of a number of online-audio-educators for a while, and they all regularly talk about the importance of good monitoring—on studio monitors AND headphones. Weirdly, the nearly unanimous opinion of a dozen audio professionals was spot-on! If you've been doing this a long time, you're probably not going to be satisfied with these. Obviously there are "better" monitors on the market. My five-star review isn't to say that these are the best speakers money can buy, but rather that these are the best speakers THIS AMOUNT of money (or indeed, considerably more) can buy you. If you're shopping for your first pair of real monitors, these are an excellent choice. The difference between these and a $1,000, $1,500, or $10,000 pair is going to be lost on someone who, like me, is not a veteran mixer. After all, the very MOST important thing is that you know how your monitoring system represents the music played on it. I plan to take the time to learn these speakers and how they and my room affect my mixes. These speakers can absolutely give you what you need to get good results. Don't believe someone who tells you you have to have expensive Focals or Genelecs or Barefoots to make good mixes. If you're shopping in this price point, rest assured that these are a quality product. End of story. Overall: Since these are my first active monitors and I'm a relatively new mixer, my opinion is not based on experience. What I will say is that these sound excellent to my ears. They have a lot of clarity. With the 5 inch woofers, I doubt their low end is a strong point. However, in my small mixing room, they are likely more than I need across all frequencies. Especially when bundled with the Pro Audio kit, I could not find a better value anywhere.